Caterpillar Local Host Plant: Dalbergia rostrata (Leguminosae). 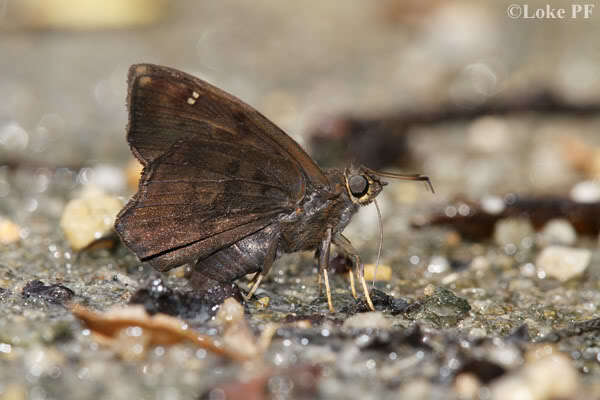 A puddling male Dark Flat showing its wing underside. 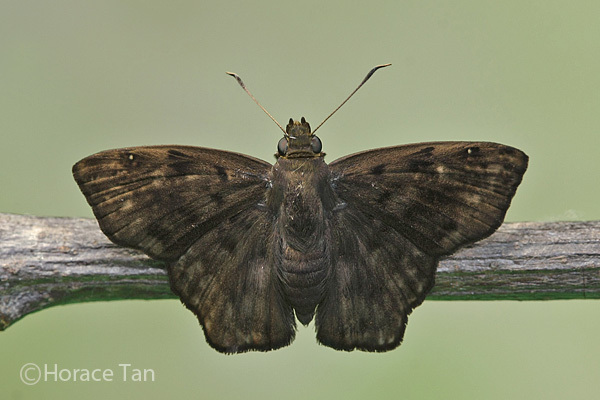 A male Dark Flat perching on a leaf in the nature reserve. Both wings are angulated at vein 3, more strongly so in the hindwing. 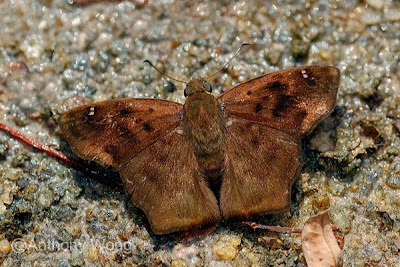 Above, the male is dark brown with obscure dark and blotchy markings. In contrast, the female is paler brown with more prominent blotchy dark markings On the forewing, there are two (spaces 7-8) or three (in spaces 6-8) small and hyaline subapical spots. The female has more hyaline spots in the base of spaces 2, 3 and 9, 10 in the forewing, and a hyaline spot near cell-end in the hindwing. Underneath, the wings are similarly marked as per above. The male has a hair tuft on its hind tibiae. The upperside of a female Dark Flat. 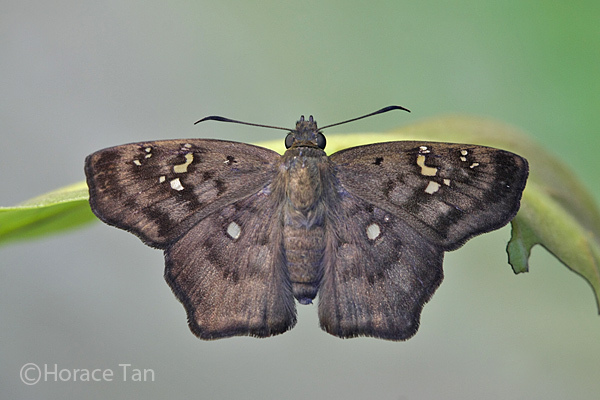 An animated sequence illustrating the hyalinity of the spots in the wings of a female Dark Flat. Although C&P4 describes Dark Flat as being rare in the Malay peninsula, this species is only moderately rare in Singapore as there has been a good number of sightings made each year. Its distribution is restricted to the forested areas within the Central catchment and Bukit Timah nature reserves. The adults are fast and strong flyers and have the habit of perching with their wings opened flat. 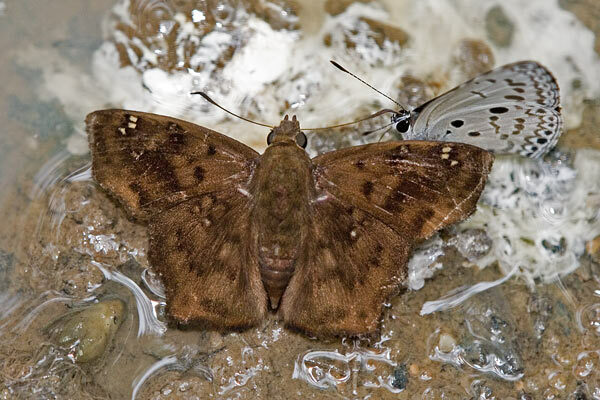 They are typically sighted when puddling on wet grounds in the nature reserve. 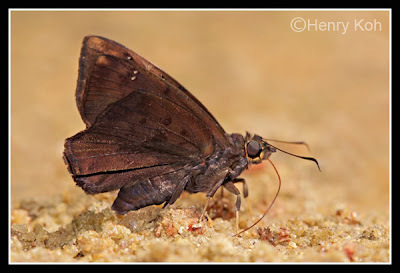 A Dark Flat puddling together with a Common Hedge Blue on a wet ground soiled with bird dropping. 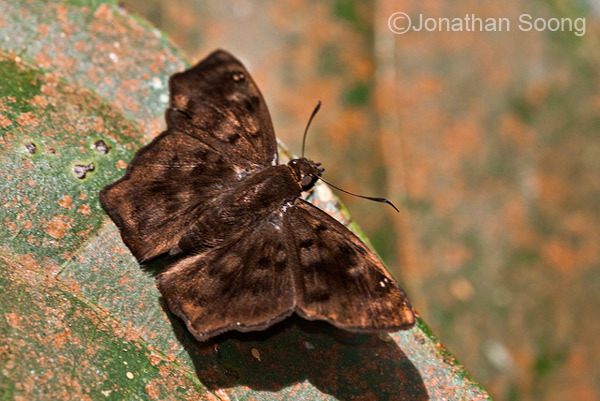 At least two Dalbergia species have been recorded as the larval host for the Dark Flat. One of them has been identified as Dalbergia rostrata, a climber which can be found in several sites in the nature reserves. The caterpillars of the Dark Flat feed on leaves of the host plant. 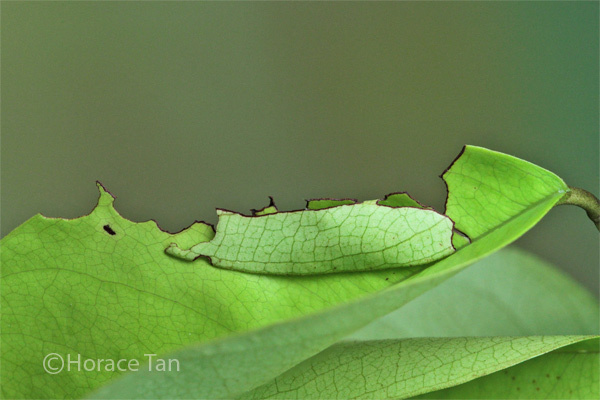 When not feeding, the caterpillars seek safety and concealment in a leaf shelter formed by cutting and folding a leaf fragment along the edge of the leaf. 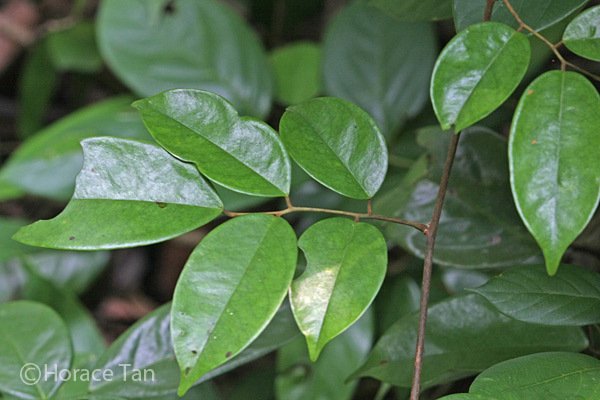 Local host plant: Dalbergia rostrata. A partially eaten leaf of the host plant Dalbergia rostrata with a leaf shelter (center of picture). 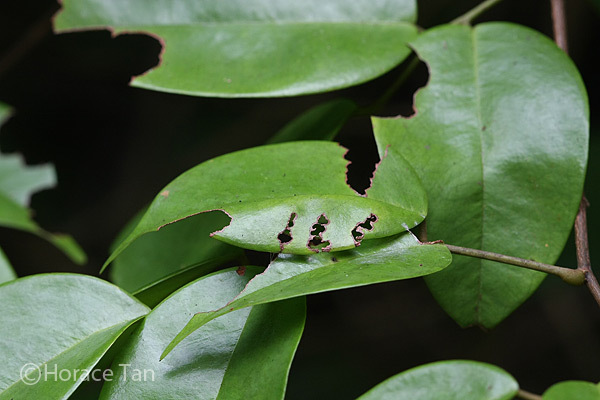 The eggs of the Dark Flat are laid singly on the young shoot of host plant. 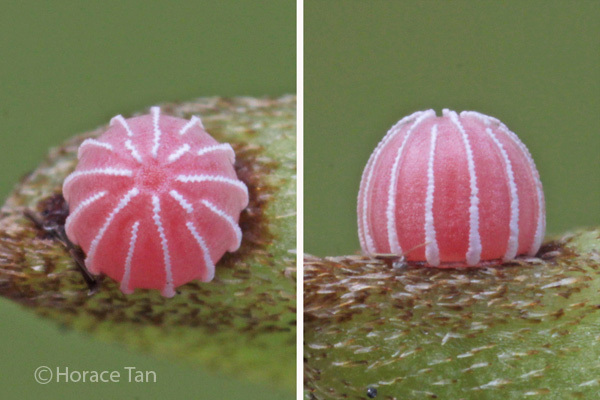 The rosy red egg is dome-shaped with a base diameter of about 0.75mm. There are a number of white longitudinal ridges running from near the top of the egg to the rim of the base. Some of these ridges originate from as far up as the micropylar whilst a few are rather short and end only a short distance from the top. Two views of an egg of the Dark Flat. Two views of a mature egg of the Dark Flat. Note the polar portion of the egg shell had already been nibbled away. Two views of an empty egg shell of the Dark Flat. The egg decolorises as it matures and takes about 3 days to hatch. 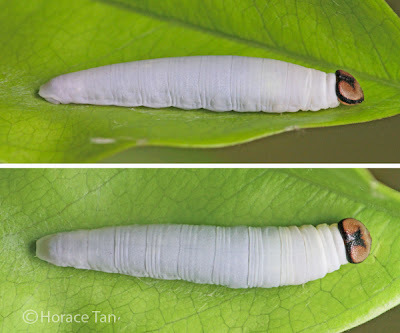 The young caterpillar emerges by eating away the polar part of the egg shell. 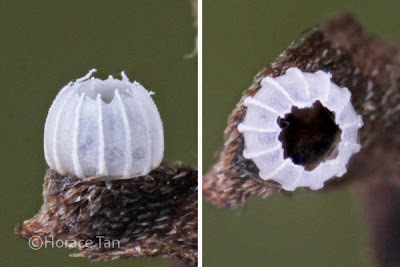 The rest of the egg shell is not eaten by the newly hatched which is about 2mm in length. At this stage, the body is golden yellow in colour. It has very rather short setae on the body surface, and a small tuff of setae at the posterior end. 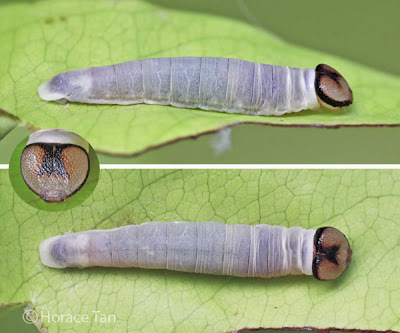 The black head capsule is heart-shaped. 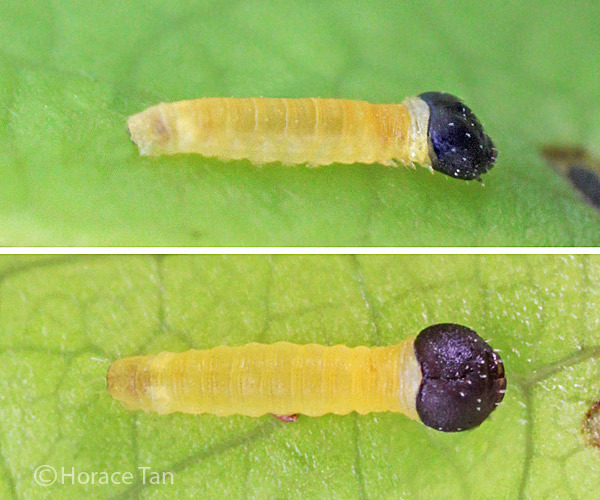 Two views of a newly hatched caterpillar, length: 2mm. 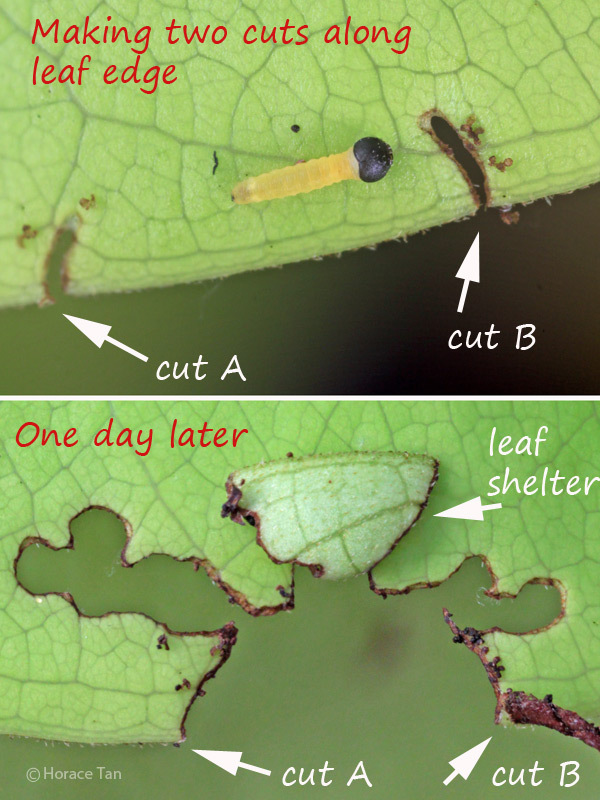 Top: Newly hatched caterpillar resting after making two cuts along the leaf edge. The cutting would resume later and continue until a flap of lamina can be folded over. Bottom: The finished leaf shelter one day later. The newly hatched makes its way to the leaf edge to construct its very first leaf shelter right away. It ventures out of the shelter from time to time to feed on the leaf lamina in the vicinity. 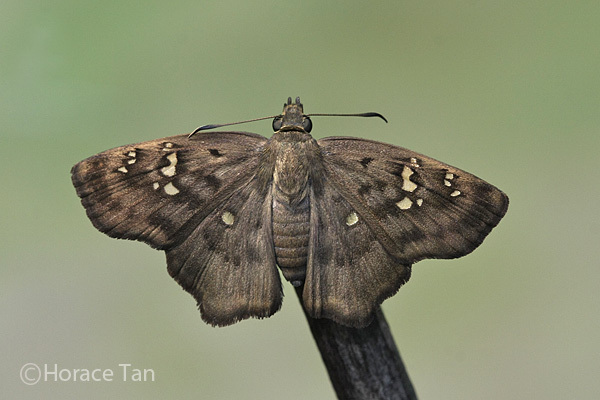 As the caterpillar grows, the body assumes a yellowish brown coloration. After reaching about 4.5-5mm in about 4 days, the caterpillar moults to the 2nd instar. 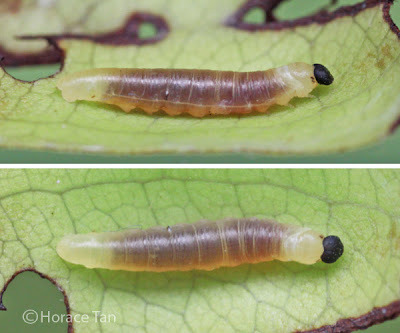 Two views of a 1st instar caterpillar, length: 3.1mm. 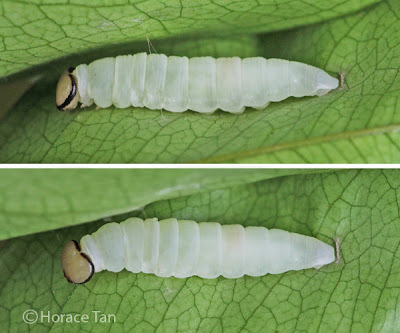 Two views of a 1st instar caterpillar, late in this stage, dormant prior to its moult, length: 4.5mm. 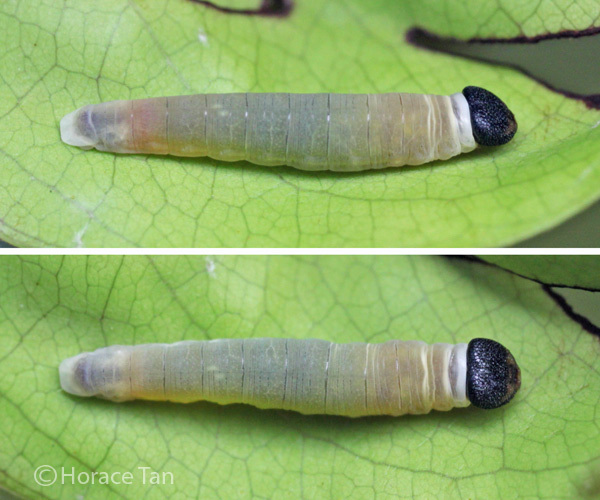 The 2nd instar caterpillar resembles the 1st instar caterpillar closely in body features except for the body colour being pale whitish. The body has a strong yellowish brown undertone initially but this changes to a duller tone the instar progresses. This instar lasts about 4 days with the body length reaching about 8-8.5mm. 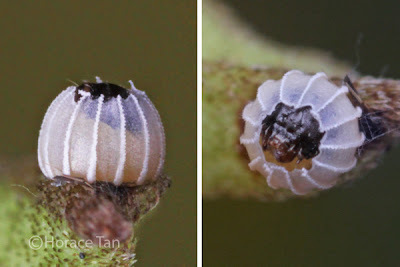 Two views of a 2nd instar caterpillar, early in this stage, length: 6mm. 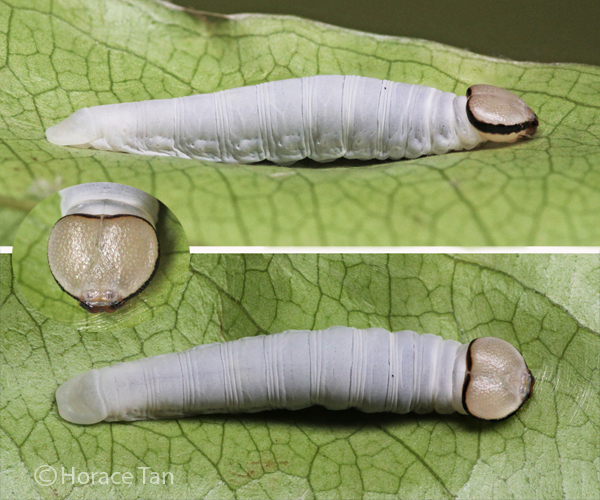 Two views of a 2nd instar caterpillar, dormant prior to its moult, length: 7.8mm. The folded leaf shelter of a 2nd instar caterpillar. 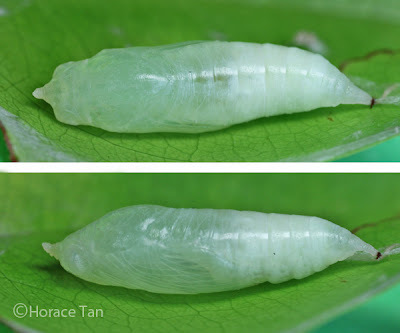 Another folded leaf shelter of a 2nd instar caterpillar, with varying illumination angles to reveal the presence of the caterpillar in the shelter. 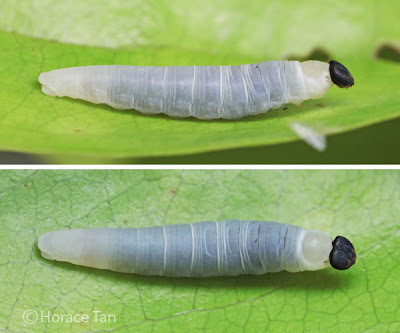 The 3rd instar caterpillar differs from the 2nd instar caterpillar in having a body colour which is strong whitish and with a weak yellowish to greyish brown undertone. The head capsule is still mostly black but the area at its lower periphery decolorises to greyish brown. This instar takes about 5-5.5 days to complete with body length reaching about 13-14mm. Two views of a 3rd instar caterpillar,length: 9mm. A late 3rd instar caterpillar, dormant prior to its moult, length: 13.5mm. The 4th instar brings about a prominent change in the head capsule which is now broader and mostly beige brown in colour. The head is also outlined in dark brown on its periphery and along the frontal cleavage line. The body colour assumes a solid milky white coloration as the instar progresses. This instar lasts about 8-10 days with body length reaching about 18-19mm. 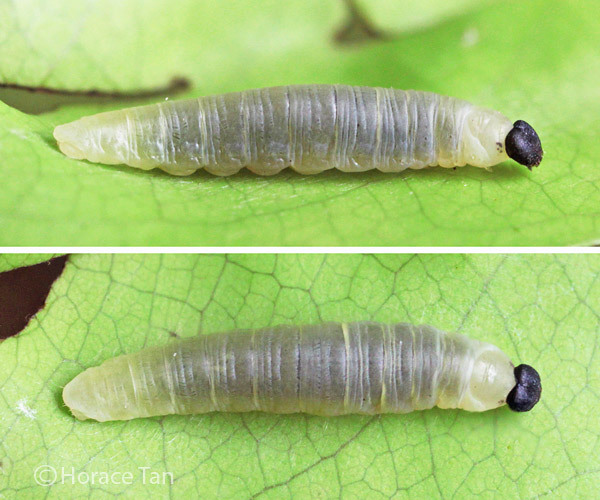 Two views of a 4th instar caterpillar, early in this stage, length: 13mm. 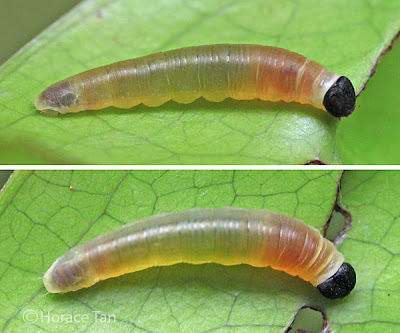 The 5th instar caterpillar has similar body markings and colour as in the late 4th instar except for the colour of its head which has now changed to a uniform beige brown due to the loss of the frontal dark brown stripe. 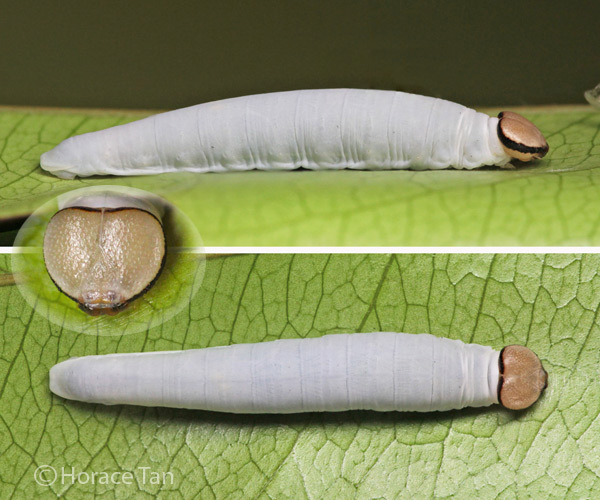 The 5th instar lasts for about 13-14 days, and the body length reaches up to 28-29mm. Two views of a 5th instar caterpillar, early in this stage, length: 20mm. 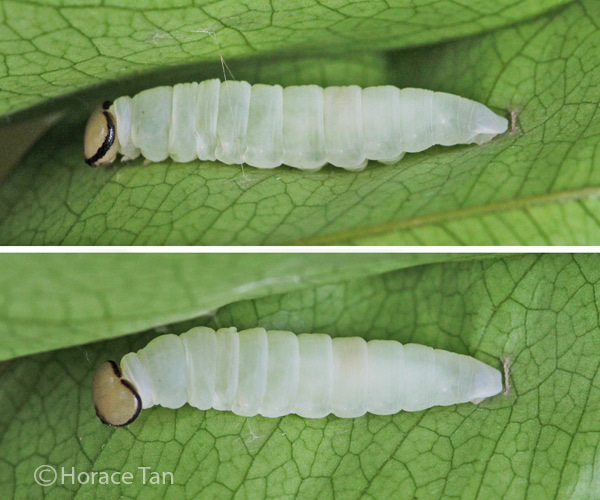 Two views of a 5th instar caterpillar, late in this stage, length: 27.5mm. On the last day of 5th instar, the body decolorises to a very pale translucent white. The caterpillar ceases feeding and stays within its leaf shelter. The pre-pupatory larva prepares for the pupal phase with a series of silk construction work with the main pieces being a silk girdle across the dorsum of its early abdominal segments, and a short and thickened transverse silk band on the substrate at its posterior end. Both the girdle and the transverse band are further secured by vertical/oblique threads to the inner wall of the shelter. Soon the pre-pupatory larva becomes dormant in its leaf shelter. Pupation takes place about 1 day later. 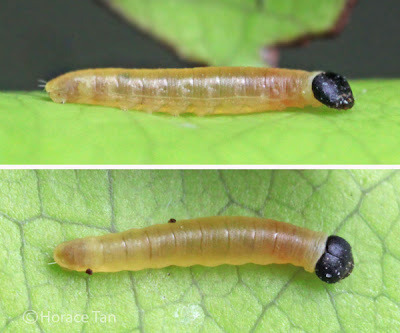 Two views of a pre-pupatory larva of the Dark Flat. The girdled pupa is secured with its cremaster attached to the short transverse band on the substrate. It has a short thorax, a rather long abdomen and a pointed rostrum. The body is pale whitish green with no markings. Length of pupae: 18-19mm. 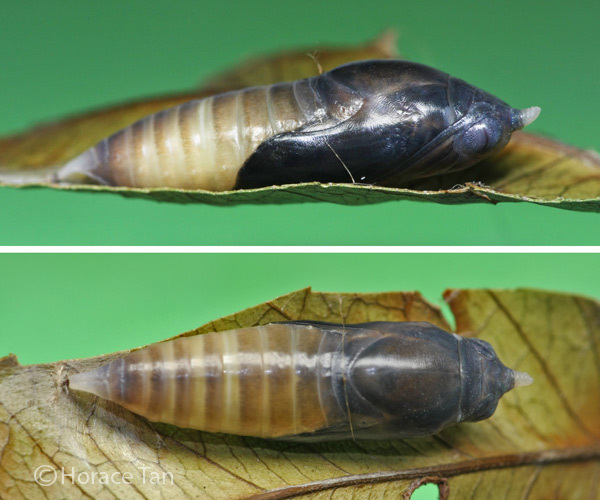 Two views of a pupa of the Dark Flat. After about 7 days in the pupal stage, the development within the pupa comes to an end and the pupa turns brown in the abdomen, dark brown to black in the thorax and wing case. The following day, the adult butterfly emerges from the pupal case. Two views of a mature pupa of the Dark Flat. A newly eclosed female Dark Flat. A newly eclosed male Dark Flat.